These are some snapshots of the plot (not the arty shots I normally attempt to do) which I’ve had for a while, and I decided they’d be quite nice to show on a separate page to show the overall development of the site. I’ll update this page over time, so keep coming back for more pics. Just a little reminder of what we started with! It’s good to look back on these pics to see how far we’ve come. And the second picture shows how it looks roughly 1 year later. This is the view from the bottom end looking back towards the shed, it must have been taken in late spring/early summer 09, as I’d only just planted the sweetcorn and squashes. This is from the top end looking down. Taken mid-late summer 09. The brassicas are under the sheet of enviromesh. The circular flower bed in the foreground needs a bit more work next year. This is the herb bed at the very top of the plot. The grass path, top right, is the main path running centrally through the whole site. The herbs here include rosemary, sage, chives, parsley, marjoram, oregano, hyssop, tarragon, mint, basil, coriander, dill, thyme, along with some spinach leaves and a few lavender plants. What an idyllic looking scene. We found those chairs for free, somebody had dumped them in the back alleyway of our old house, along with a broken table and couple more broken chairs. We decided to take the two chairs that were not broken. They’ve proved very useful on the allotment for our tea breaks. Yes, that is me trying to hide behind the sweetcorn! John will probably hate me for including this picture with him in it, but it’s the only one I have that shows (almost) the full length of the plot. I also wanted to show the grass path that runs down the length. As we dug over the plot, we piled up the turves onto this path to raise it up slightly in height, and now the grass has successfully re-grown. It’s a bit of a pain keeping the edge neat and weed free, but at least it’s no longer a mud path as it was in the first year. 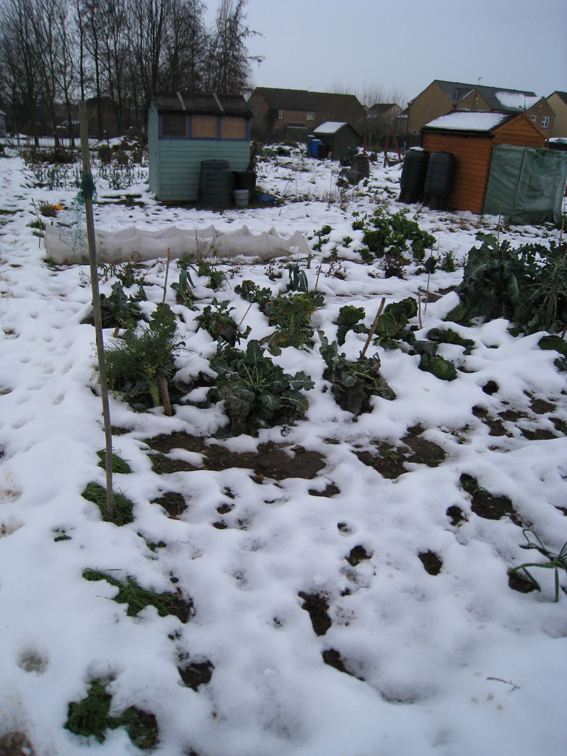 As you can see near the shed, we have a small manual push mower, invaluable on an allotment if you have grass paths. 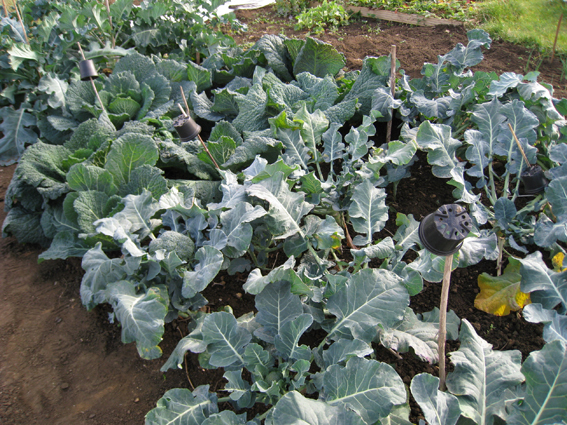 The brassica bed in October 09. The plot in December 09. Wonderful what you’ve achieved there Zoe! Love it. Thanks very much! It’s been a lot of hard work, but nice when you look back at how far you’ve come.